Hello stampers! Are you having a good Tuesday? It's great here - I just finished up one fun Just Cards stamp camp and have another tonight AND the sun is shining and it's actually WARM outside today! Yesterday, it was so, so pretty outside, but boy was it cold! When I sat down to finally complete last Friday's Blogger's Challenge, I went for colors that made me feel like August - Hot, Hot, Hot! Our Blogger's Challenge was to take an older creation and re-create it, changing at least two things! Well, as you can see - sorry if you need sunglasses - I changed more than two things! The first card pictured here was one that I'd actually cased in part from one I'd seen on a website somewhere about 6 months ago. I liked the layout and colors and just gave it my own twist. Since I liked the layout so much, I decided to go with it again and see where these warm, wonderful colors would take me. I began by using two of the current In Colors, which will be retiring at the end of June - Riding Hood Red and Tangerine Tango. I added Summer Sun into the mix and pulled out my new, old standby Garden Greetings stamps. Do you own this set yet? Why not? It's a must own - I've made a ton of projects with it since January. It's just one of those that you can't make an ugly card with it. The folded cardbase is Riding Hood Red cardstock and I've layered it with a piece of Summer Sun cardstock that's stamped with the small flower in Summer Sun ink. A piece of Tangerine Tango Striped Grosgrain ribbon wraps the left side. I stamped a piece of Whisper White cardstock in a flower collage with Tangerine Tango, Riding Hood Red and Summer Sun then cut it out with the Big Shot Top Note Die. The perforated edge is trimmed off with my Paper Snips and layered on another Top Note cut out of Tangerine Tango cardstock. 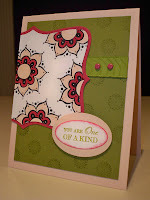 These layers are popped up on Stampin' Dimensionals and once mounted on the cardfront, were trimmed off down the left side of the Summer Sun cardstock. Then I used my Word Window Punch and added the window to the lower right corner for the greeting. I stamped it with Tangerine Tango on to Whisper White cardstock and just adhered it behind the window with SNAIL adhesive. THAT way it's straight, no guesswork! 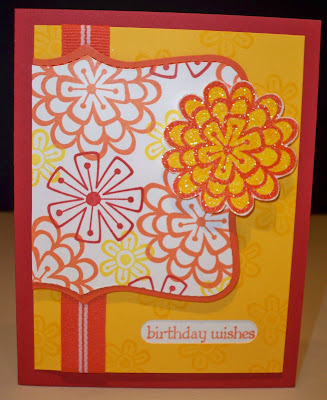 Lastly, I stamped the large flower with Tangerine Tango ink on to Whisper White cardstock and colored it in with a Summer Sun Stampin' Write Marker. This was coated with Versamark ink and dipped in Iridescent Ice Embossing Powder. After heat setting with my Heat Tool, I trimmed it out and mounted it with more dimensionals. I know, that all sounds like a lot of work, but it really wasn't! Even my stamp campers this morning liked this card the best! I know I am late with this weeks challenge, but I know my other Blogger's Challenge gals were not so be sure to check out all their great artwork by clicking on the link in my sidebar. Thanks for stopping by to visit today - I'd love to hear from you so post a comment so I know you are there! I LOVE them both - what a great layout! Both cards are great but your new one does scream SUMMER!!!!!! And I am soooo ready for it it isn't even funny!! I am so tried of the rain here!! Can't wait to see you soon!!! Oh! What a bright, uplifting, and fun card. Love the CASE. Your birthday week? Have a wonderful, wonderful day and enjoy it to the hilt. Both cards are too cute! That layout is great and I LOVE orange! We need heat here, too! Great cards, Robin! Love the brightness of the second one--I feel the warmth! Great CASE, love the new color combo and the touch of glitter! How pretty and summery! Great Job! Love the vibrant color combination--wow! I've been going back and forth about whether or not to get this set, but I think I may have to cave and add it to my collection. Great card and I love the bright colors!!! WOW! I love, love, love the bright colors on your new version. How pretty. - The layout is great and both cards were wonderful but I love the pizzaz that 2nd card has.